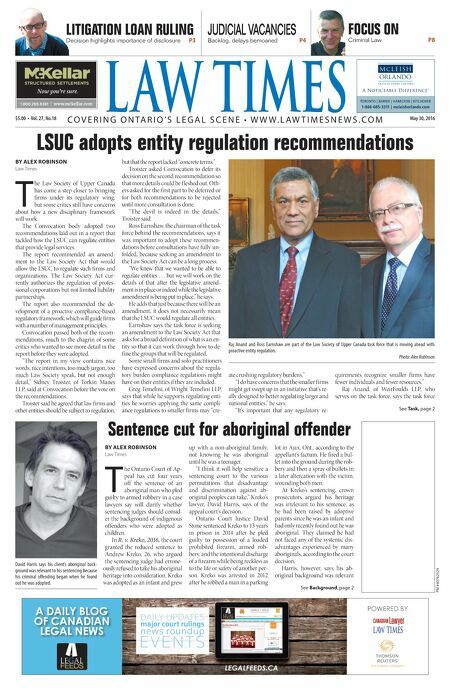 LSUC adopts entity regulation recommendations BY ALEX ROBINSON Law Times T he Law Society of Upper Canada has come a step closer to bringing firms under its regulatory wing, but some critics still have concerns about how a new disciplinary framework will work. The Convocation body adopted two recommendations laid out in a report that tackled how the LSUC can regulate entities that provide legal services. The report recommended an amend- ment to the Law Society Act that would allow the LSUC to regulate such firms and organizations. The Law Society Act cur- rently authorizes the regulation of profes- sional corporations but not limited liability partnerships. The report also recommended the de- velopment of a proactive compliance-based regulatory framework, which will guide firms with a number of management principles. Convocation passed both of the recom- mendations, much to the chagrin of some critics who wanted to see more detail in the report before they were adopted. "The report in my view contains nice words, nice intentions, too much jargon, too much Law Society speak, but not enough detail," Sidney Troister, of Torkin Manes LLP, said at Convocation before the vote on the recommendations. Troister said he agreed that law firms and other entities should be subject to regulation, but that the report lacked "concrete terms." Troister asked Convocation to defer its decision on the second recommendation so that more details could be f leshed out. Oth- ers asked for the first part to be deferred or for both recommendations to be rejected until more consultation is done. "The devil is indeed in the details," Troister said. Ross Earnshaw, the chairman of the task force behind the recommendations, says it was important to adopt these recommen- dations before consultations have fully un- folded, because seeking an amendment to the Law Society Act can be a long process. "We knew that we wanted to be able to regulate entities . . . but we will work on the details of that after the legislative amend- ment is in place or indeed while the legislative amendment is being put in place," he says. He adds that just because there will be an amendment, it does not necessarily mean that the LSUC would regulate all entities. Earnshaw says the task force is seeking an amendment to the Law Society Act that asks for a broad definition of what is an en- tity so that it can work through how to de- fine the groups that will be regulated. Some small firms and solo practitioners have expressed concerns about the regula- tory burden compliance regulations might have on their entities if they are included. Greg Temelini, of Wright Temelini LLP, says that while he supports regulating enti- ties he worries applying the same compli- ance regulations to smaller firms may "cre- ate crushing regulatory burdens." "I do have concerns that the smaller firms might get swept up in an initiative that's re- ally designed to better regulating larger and national entities," he says. "It's important that any regulatory re- quirements recognize smaller firms have fewer individuals and fewer resources." Raj Anand, of WeirFoulds LLP, who serves on the task force, says the task force Sentence cut for aboriginal offender BY ALEX ROBINSON Law Times T he Ontario Court of Ap- peal has cut four years off the sentence of an aboriginal man who pled guilty to armed robbery in a case lawyers say will clarify whether sentencing judges should consid- er the background of indigenous offenders who were adopted as children. In R. v. Kreko, 2016, the court granted the reduced sentence to Andrew Kreko, 26, who argued the sentencing judge had errone- ously refused to take his aboriginal heritage into consideration. Kreko was adopted as an infant and grew up with a non-aboriginal family, not knowing he was aboriginal until he was a teenager. "I think it will help sensitize a sentencing court to the various permutations that disadvantage and discrimination against ab- original peoples can take," Kreko's lawyer, David Harris, says of the appeal court's decision. Ontario Court Justice David Stone sentenced Kreko to 13 years in prison in 2014 after he pled guilty to possession of a loaded prohibited firearm, armed rob- bery, and the intentional discharge of a firearm while being reckless as to the life or safety of another per- son. Kreko was arrested in 2012 after he robbed a man in a parking lot in Ajax, Ont., according to the appellant's factum. He fired a bul- let into the ground during the rob- bery and then a spray of bullets in a later altercation with the victim, wounding both men. At Kreko's sentencing, crown prosecutors argued his heritage was irrelevant to his sentence, as he had been raised by adoptive parents since he was an infant and had only recently found out he was aboriginal. They claimed he had not faced any of the systemic dis- advantages experienced by many aboriginals, according to the court decision. Harris, however, says his ab- original background was relevant LITIGATION LOAN RULING Decision highlights importance of disclosure P3 JUDICIAL VACANCIES Backlog, delays bemoaned P4 FOCUS ON Criminal Law P8 See Background, page 2 See Task, page 2 PM #40762529 $5.00 • Vol. 27, No.18 May 30, 2016 L AW TIMES & $#&!&jmmm$cYa[bbWh$Yec ntitled-4 1 12-03-20 10:44 AM C O V E R I N G O N T A R I O ' S L E G A L S C E N E • W W W . L A W T I M E S N E W S . C O M TORONTO | BARRIE | HAMILTON | KITCHENER 1-866-685-3311 | mcleishorlando.com cLeish Orlando_LT_Jan_20_14.indd 1 14-01-15 3:15 PM Raj Anand and Ross Earnshaw are part of the Law Society of Upper Canada task force that is moving ahead with proactive entity regulation. Photo: Alex Robinson A DAILY BLOG OF CANADIAN LEGAL NEWS LEGALFEEDS.CA FEEDS LEGAL POWERED BY David Harris says his client's aboriginal back- ground was relevant to his sentencing because his criminal offending began when he found out he was adopted.